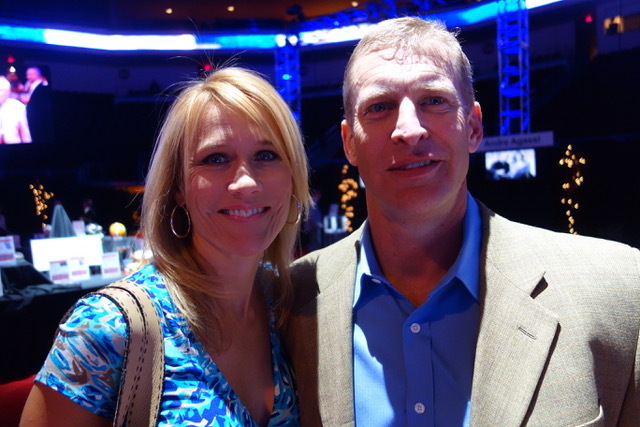 (CAPTION: BOBBY HAUCK AND HIS WIFE STACEY IN 2013.) PHOTO: NORM CLARKE Former UNLV football coach Bobby Hauck is reportedly “in play” to return to the University of Montana, where he won seven Big Sky titles. Hauck’s name surfaced as soon as Bob Stitt was let go after losing to archival Montana State for the second year in a row on Saturday. Hauck, 53, joined San Diego State University two years ago as special teams coordinator and named associate head coach in charge of special teams in 2016. He guided UNLV to its first bowl in 13 seasons in 2014, the fourth year of a five-year contract. UNLV lost to North Texas in the Heart of Dallas Bowl. The Rebels finished 7-5 for the season then stumbled to a 2-11 mark in year five and was fired. He finished with a 15-49-0 record. Hauck had an 80-17 at Montana, including a 47-6 mark in Big Sky play. He took Montana to consecutive FCS title games in his final two years in Missoula. He had his critics with the success. His battles with the student newspaper and the media were well documented. San Diego State, 9-2, closes out its regular season at home against New Mexico, 3-8.